Our Skin Revealing Body Lotion 10% AHA got a new look! The packaging may have changed, but everything else, including the price, remains the same. Get soft, smooth and even-toned skin all over. This creamy, lightweight leave-on exfoliant contains 10% AHA which gently but effectively sheds built-up dead skin cells to reveal smoother, more radiant skin. The gentle lotion also helps to improve the appearance of rough, bumpy skin on the arms and legs leaving skin soft and moisturised. Massage onto clean skin in gentle circular motions. May be used daily or applied only to dry areas as often as needed. If using with an additional moisturiser, apply this treatment first and adjust amount used based on personal preference. For daytime use, wear under a Paula's Choice sunscreen. I have KP on my upper arms and some occasional red bumps on my bum. After ordering few samples (I personally required 3 samples to use it on my entire body) to see the texture of the product and skin reaction, I ordered a whole tube. As long as you use it religiously - it works! When I stop using it, the red bumps appear almost immediately again. The good thing is that its texture is not that heavy for my usually oily body skin and allows to use it quite frequently these days (in colder weather). In the summer time I doubt I will be able to use it more than once a week. My skin type (body) is dry, generally blemish/pimple free, pale with regular-life scars, smaller surgery entry scars and stretch marks. So every single flaw is visible when there are any. My goals for the product was to help encourage long-term skin tightening after weight loss, exfoliation that leaves my skin soft for a long time, scar/mark fading and general ageing and orange-peel texture help. Results: After 2½ weeks of use I've found that this product, for me, does cover every single one of my problems. I use it on my entire body about 3 times a week - I use it over my hands/arms/chest/specific scars almost daily. My skin tone makes every flaw very visible and I've noticed that my dark surgery scars are lightening up. My teenage stretch marks (healed, white, non-irritated) are becoming very smooth and almost melting into the skin texture around it a lot better. My hands (palm and top) are smooth all day long, which includes a lot of hand-washing. I have no dead or rough skin on my elbows, knees or feet. Everything in general just has this silky soft feel that I've never experienced before - and no greasy feeling at all. Obviously I cannot yet comment on how it might encourage skin tightening, but I'm expecting it will be a nice help in the right direction coupled with building up muscle. All in all I honestly feel like this is an essential product in a well-set body care routine! I'm glad I started using this at the age of 25, but this is something both younger and older people of any gender identity could really benefit from. Negatives: While it spreads easily it's also soaked up so fast that it's hard to spread it out over a large enough area, so I end up using more product than I really want to, to cover enough of my body. So the amount of waste/excess use for the price of the product is my least favourite thing about it. I find that it's still necessary to use another hydrating body lotion weekly. While this product does remove dry/dead skin and makes it soft, it doesn't necessarily feel moisturised. I'm very happy and will re-purchase once I run out! I love this product. It is working like on descriptions. Powerfull exfoliator, no irritations. I am 49 and this product made miracle on my skin - nice soft baby skin, with a fresh color. On my feet I put firs this lotion and follow with a moisturizer or body butter, and do not need any special care. My husband feel the difference!! My daughter put it on her face and she has not broke out any more. One more - this product is perfect to fight with a old scars - On my left hand, my big old burning scar is disappeared!!! What more have I pretend from a cosmetic product? And the price - fantastic!!! THANK YOU !!! I use this lotion several times a week on my body and only twice a week on my face (it irritates my skin if I use it more often). My skin just feels incredible soft and not just the day after using it. It stays like that :) I did not know that a moisturizer can be as good as that so I definitely recommend it. I did not notice an improvement for the small rough bumps on my skin but I have seen that for this issue is recommended the "Paula`s Choice Weightless Body Treatment with 2% BHA" so I guess I should try this one too. I really really love this product! I had a hard time using the resist Weekly resurfacing 10% liquid on my face. I think I put too much or something. But I have since tried this product and it is perfect! My skin on my body is looking and feeling much better too. I even use a tiny amount around my cuticles with great results. My skin is so smooth and soft now! I can not recommend this product enough. I've used this for 6 months hoping it would help the keratosis pilaris on my upper arms, but it hasn't had any affect. I also tried the Skin Revealing Body Lotion with 2% AHA for the previous 6 months and had hoped that the 10% formula would have some effect. It does slightly minimize the overall redness, but the kP is the same. I would say this is a good moisturizer to reduce general redness, but not to clear up KP. Also, in an effort to try and use it up, I tried it on my legs but found it made my skin burn slightly after use. I'm not sure why this is recommended for dry skin areas as I found it quite harsh on drier skin. Customer Care: Thank you for your review. If you have tried both AHA and BHA, and neither has worked, we encourage you to contact customer care to discuss how the products were being used. We look forward to hearing from you and assisting you further! ... as with all PC products this is an excellent choice for the skin. However, I feel it could be improved by creating a liquid/gel version. Currently the formulation as it stands does not go far or last long, making it rather expensive. Please bring out a gel/liquid version like the facial chemical exfoliant products!!! Customer Care : Thank you for your feedback and we will forward it on to our team. this is a great body lotion! it sinks right into skin and is really non-sticky. i use it on my dry legs, especially in winter. excellent lotion, effective and non-sticky. This is the second bottle I´ve ordered and I am dissappointed because even though the product is the same the quantity and price aren´t and we´re talking about 30ml less which I consider to be excesive. I hope this is not going to be the case for every other product from PC in my opinion not a good strategy! Customer care reaction: We appreciate your comments and will share them with Paula and her staff. Aqua, Glycolic Acid (Alpha Hydroxy Acid, exfoliant), Cyclopentasiloxane (hydration), Dimethicone (hydration), Glycerin (hydration/skin replenishing), Glyceryl Stearate (texture-enhancing), Cetyl Alcohol (texture-enhancing), Butyrospermum Parkii (Shea) Butter (emollient/antioxidant), Stearic Acid (texture-enhancing), Sodium Hydroxide (pH adjuster), PEG-100 Stearate (texture-enhancing), Xanthan Gum (texture-enhancing), Tetrahexyldecyl Ascorbate (vitamin C/antioxidant), Tocopheryl Acetate (vitamin E/antioxidant), Disodium EDTA (stabilizer), Butylene Glycol (hydration), Allantoin (skin-soothing), Chamomilla Recutita (Matricaria) Flower Extract (skin-soothing), Vitis Vinifera (Grape) Seed Oil (non-fragrant oil/emollient/antioxidant), Camellia Oleifera (Green Tea) Leaf Extract (antioxidant), Epilobium Angustifolium (Willow Herb) Flower/Leaf/Stem Extract (skin-soothing), Phenoxyethanol (preservative), Sodium Benzoate (preservative). 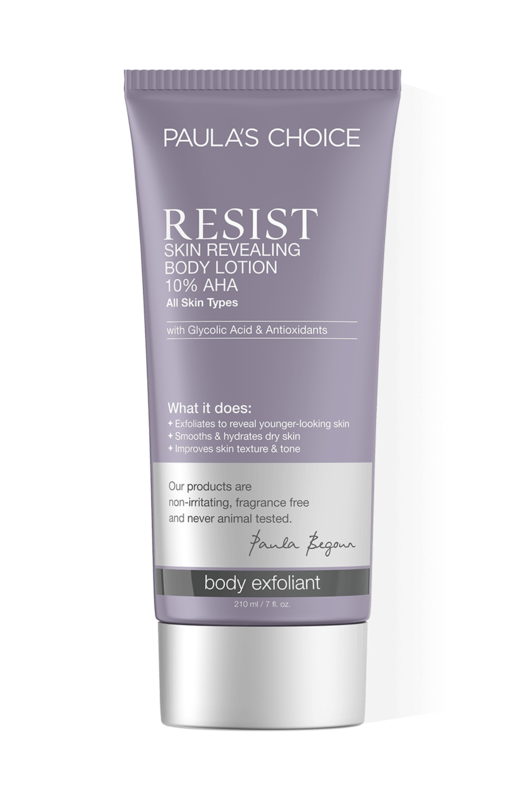 How is Paula's Choice Skin Revealing Body Lotion with 10% AHA different from the 8% Alpha Hydroxy Acid Gel? Do I need both? The two major differences between these exfoliants are that the Skin Revealing Body Lotion is in a creamy moisturising base while the 8% AHA Gel has a fluid, gel base. The concentration of glycolic acid is the other main difference, with the Skin Revealing Body Lotion containing 10% AHA and being designed for use from the neck down. Both AHA products are formulated within the pH range needed to exfoliate dry, sun-damaged skin. Can I use Skin Revealing Body Lotion with 10% AHA on my face? Although the formula has been developed for the body, it is also possible to use it on your face. If you have used AHA products (formulated in an acidic pH range to allow for exfoliation) on your face without irritation, you should be able to use Skin Revealing Body Lotion too.